Eleanor Rodney owned Stokefield House in Thornbury from 31st January 1855 until her death on 18th July 1873. She was born Eleanor Hume 11th May 1806 in London. She was the third daughter of Joseph Hume of Upper Charlotte Street, Fitzroy Square and his wife Catherine Elizabeth. She was the sister of Catherine Lloyd (the wife of Edmund Lloyd) of Fairfield House and of Caroline Lewis of The Priory in Castle Street. She was also the sister of John Gwennap Hume who was already the occupier of the house according to the sale notice at the time she bought it. 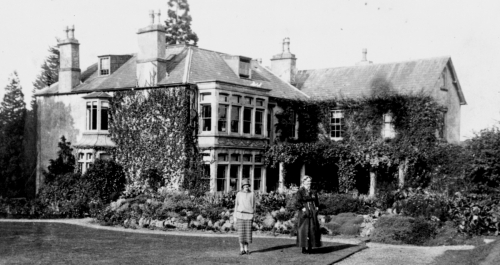 The photograph on the left was taken in 1925 and shows the later owners of Stokefield House in Thornbury, Madeline Jenkinson and her daughter Georgina. However we believe that the property would have looked very similar during its occupation by Eleanor Rodney. Other owners of Stokefield House. Eleanor’s husband, John Stratford Rodney was born in London on 14th May 1802. He was the eldest son of the Chief Secretary to Government in Ceylon, Hon. John Rodney and his wife Lady Louisa (nee Louisa Martha Stratford). He became 2nd Lieutenant 23rd March 1823. John Stratford Rodney was in the Ceylon Civil Service. He was Sitting Magistrate of Colombo and an Assistant Government Agent in Madawalatenna) from 1831 to 1838. His first wife was Anna Boyce of Bombay, who died February 3, 1825. His second wife was Eleanor Hume, whom he married on 23rd December 1826 at New Church St Pancras. Eleanor and John Stratford Rodney had two children; Catherine Dora Rodney who was born in Ceylon and Tollemache Montague Brydges Rodney. John Rodney was living in Cheltenham in the 1851 census. He was aged 48 and his occupation was described as in the “Ceylon Civil Service.” His wife Eleanor was 39. Their son Montagu aged four lived with them. They had a cook and a housemaid. In the 1851 census Catherine Dora Rodney was a schoolgirl living in the household of the Rev D’Arville and his daughters Katharine and Ann in Olveston. There were two other young ladies in the household. John Stratford Rodney died at Florence on December 28th 1854 aged 53. On 31st January 1855 Eleanor Rodney (described as late of Cheltenham) bought Stokefield House and its closes of land from Sir John Key . The properties were described as numbers 26, 27 and 345 on the Tithe Map of 1840. Sadly John and Eleanor’s son, Tollemache died of scarlet fever in Weston Super Mare on April 24th 1858 aged only 11 years. The rate book of 1859 shows that “Mrs Lloyd “owned Stokefield House and that it was occupied by Mrs Rodney. At the moment we are unable to explain this as clearly Mrs Rodney should have been the owner. Catherine Dora Rodney, daughter of John Stratford Rodney and Eleanor Hume married Henry Craven St John on 8th May 1860 at Thornbury. The 1861 census shows that Stokefield House was occupied by Eleanor Rodney a 56 year old widow. She was sharing the house with her daughter Catherine Dora St John aged 24 and Catherine’s baby son Montagu Rodney St John and their servants. By 1862 Mrs Lloyd’s name was crossed through in the rate book entry and the house was said to be owned and occupied by Mrs Rodney. In 1867 and 1871 the rate books showed the house continued to be owned by Mrs Rodney. The first reference to the name “Stokefield” as applied to the main house (until 1985 used as the Council Offices) appears in the Will of the late Mrs. Eleanor Rodney dated the 4th March 1868. Eleanor Rodney died on 18th July 1873. In her will of 4th March 1868 she appointed Rev Edward Gordon Penny and her son in law Henry Craven St John executors. From 1876 the rate books say the owner and occupier was Henry Craven St John.